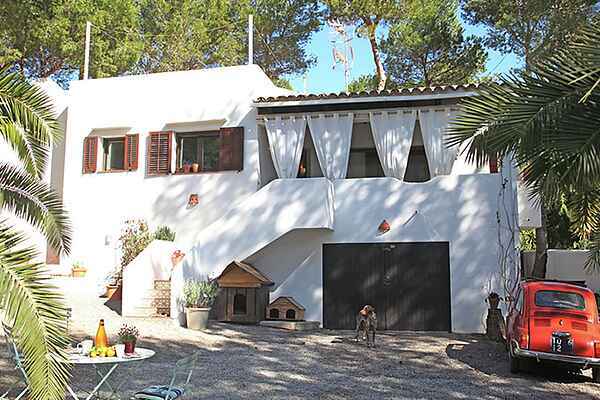 This home, located in the charming village of Cala Lenya, a few kilometers from San Carlos. Each zodag you can walk to one of the best hippy markets on the island. Also is the house within walking distance of the beach. From the road you drive through a corridor to the house. Through a gate you reach a garden of pebbles. Left is completely isolated a wooden house where the owner resides with her very sweet dog and two cats. You can reach the house with a wide staircase. Here is a nice terrace with dining table. You enter directly into the living room and the open kitchen. The kitchen is not large but very practical. And well equipped with everything you need to cook. Juicers also provided. Left goes to the first bedroom across from the bathroom with toillet bath or shower. Then comes another bedroom with also opposite a large shower room with shower and toillet.Dan we have the huge dakterr where the sunbeds already ready to plunge into a wonderful book. Cala Lenya offers plenty of hiking opportunities through beach and beautiful surroundings.